The literal meaning of orthopaedic is anything related to or concerned with muscles, ligaments and joints. Therefore, any ailment, injury or disease that causes problems or pain in muscles, ligaments or joints is known as orthopaedic disorders. 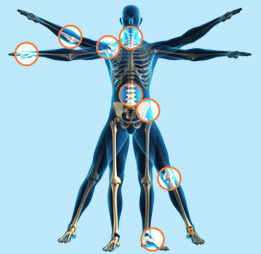 There are n-number of orthopaedic diseases, which makes it impossible to list them. However, following are some common disorders and conditions, which people experience often at some point of time. Arthritis – It is a rheumatic disease. People suffering from this disease show the symptoms like pain in connecting tissues, swelling and limited movement. A large number of people suffer from this disease. A chronic disease slowly progresses. However, the cause for this disease are yet unknown. Osteoarthritis – Also termed as degenerative arthritis or degenerative joint disease, osteoarthritis is a very painful and the most common form of orthopaedic problem. As a person ages, the joint cartilage breaks down. It usually occurs in hands, hips, knees or spine. Rheumatoid arthritis – It is a disease which causes severe inflammation of joints, which ultimately limits the movement of the joint. Lumps form over the joint, which hampers its movement as well as its appearance. It occurs when the body’s immune system attacks its own healthy tissues and cells. This disease may last a lifetime and get even worse over time. Fractures – Fractures further have various types. Open fractures are the ones where bones protrude skin or any wounds that exposes the bone through the skin. A closed fracture or a simple fracture is the one with a broken bone but not necessarily protruding through skin. Fractures – Arnica is the best pain relieving homeopathic remedy for fractures. It is used just after the injury is caused to reduce the pain and swelling. Osteoarthritis – Ruta is recommended for osteoarthritis with worst pain and feeling of heat in skin is worsening by over exertion. Rheumatoid arthritis – Antimonium crudum is the top homeopathic remedy for rheumatoid arthritis when the patient suffers from pain in fingers joints, which worsens in cold weather or when washed with cold water. Orthopaedic issues and injuries can be avoided by taking control measures while exercising, lifting, running, and working. Sitting in a correct posture at workplace may be beneficial for back pain and spinal injuries. While lifting heavy objects, one should take care that object should be close to the body, firm hold and correct position should be maintained to avoid jerks. Maintain a healthy lifestyle to avoid such diseases.